This week's Illustration Friday topic is: Crunchy. 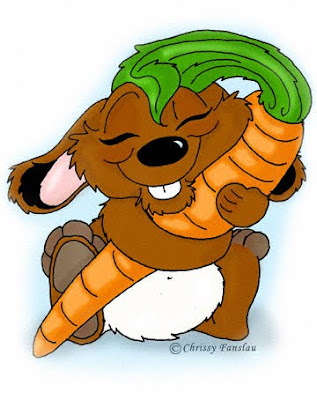 As is this little guy's carrot, for which he has great affection. This image is among many available as a greeting card in my GCU store. Thank you for dropping by today. Have a wonderful weekend! Very fun image... nice bunny design! Awww! So adorable! What a great take on the theme this week, and what a great work of illustration genius! Nice work, it´s lovely and the colours are beautiful! Regards. he he he he!! Oh he looks like he is in heaven holding on that delicious crunchy carrot!! He is just adorable! Your style is such a delight. Great work! Thanks for stopping by!